NAJAF, Iraq (Reuters) - On a backstreet in Iraq's holy city of Najaf, Iranian pilgrims shuffle in and out of a small doorway, making a short but important detour. 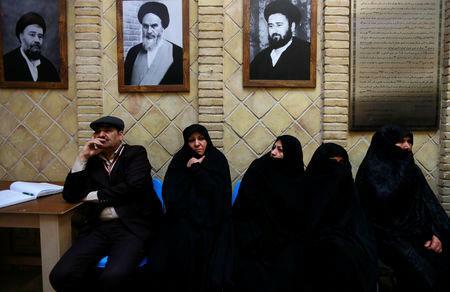 They have come to see where the leader of the Islamic revolution once dwelled in exile. The former home of the late Ayatollah Ruhollah Khomeini, who in 1979 led an uprising that ousted the Shah of Iran, is bustling with tourists on the 40th anniversary of the birth of the Islamic Republic. Escaping for a moment Najaf's crowded Shi'ite Muslim shrine nearby, they tour the humble home which is now a museum and gallery showcasing Khomeini's political and personal life. Teenagers take selfies in rooms where he studied, prayed and developed his ideas for the establishment of an Islamic state. "The house captures the spirit of Khomeini. He was not interested in money or worldly possessions - he was there to serve the people," said one visitor, 56-year-old Mohammad Javad Elahi. Khomeini's Najaf abode, where he lived for 13 years before being expelled from Iraq by Saddam Hussein in 1978, has little furniture. His private meeting room is small with only a carpet to sit on. 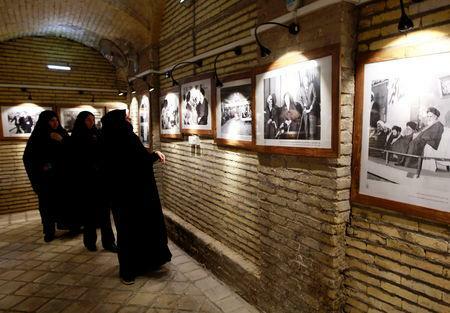 Photos on the walls show Khomeini with his children and grandchildren, although most are iconic pictures of the uprising, including the takeover of Iran's embassy in Paris by protesters and Khomeini's arrival by plane in Tehran after the fall of the Shah. Elahi, a logistics manager from Tehran, said he saw Khomeini's legacy as an Iran that stands firm in the face of U.S. sanctions. Despite unrest over a hurt economy, sanctions had served to unite many Iranians behind their current government, he said. "We don't suffer the upheaval of some of our neighbors. Things are mostly stable," he said, referring to conflicts in Arab countries in recent years. Other visitors said they saw the Islamic republic as an improvement on the secular monarchy which it replaced. "I was 13 during the revolution. I remember the time of the Shah. He was a Western puppet – the economy and politics of Iran was basically in the hands of America and its allies," said Alireza Ghorbani, a retired school teacher. "The Shah's secret service killed and tortured opposition, including clerics." The 1979 uprising deposed Western-allied Shah Mohammad Reza Pahlavi. Khomeini spent the final year of his exile in France. Khomeini's Islamic republic, and the leadership that has followed it under Supreme Leader Ayatollah Ali Khamenei, have been criticized internationally for crackdowns on political opponents, including during protests over alleged election fraud in 2009 and last year over wages and complaints of corruption. 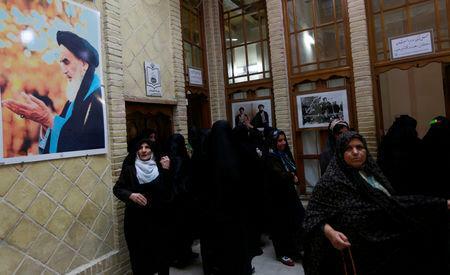 Those visiting Khomeini's Najaf home, all religious tourists, said they support Iran's clerical establishment. "Most people in Iran supported the revolution," said Mohammad Kazemi, a clergyman from northwestern Tabriz. "Things are still better than before. Today I'm here to pay my respects to its leader." Khomeini went into exile in the 1960s, first to Turkey then to Najaf. The Iraqi city and Qom in Iran are the seats of the two great seminaries for Shi'ite clergy. Iraq's top Shi'ite cleric Grand Ayatollah Ali al-Sistani is based in Najaf. Khomeini mostly kept a low profile in Najaf, studying and lecturing, but also developed his ideas for a system of Islamic governance. Iran's influence in Iraq, which has steadily grown since the U.S. invasion that toppled Saddam Hussein in 2003, has brought with it increasing numbers of Iranian tourists and pilgrims. Hundreds of thousands visit Iraq's holy shrines at Najaf and Kerbala each year. This week, many were stopping through Khomeini's home.